the U.S. from the Paris Agreement. During late 2015, the U.S. and 195 other nations committed themselves to a historic environmental pact: the Paris Agreement. It requires almost all the countries of the world to start or continue to abandon their use of fossil fuels and convert to green energy sources. The latter include: wind turbines, solar panels, geothermal energy, hydropower generation, hydel power (power from ocean waves or tides), and nuclear power generation. This would reduce the amount of carbon dioxide and other greenhouse gasses added to the atmosphere, and thus eventually reduce global warming/climate change. 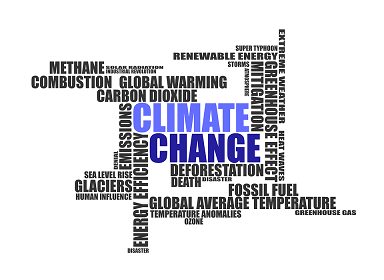 However, the change in Earth's surface temperature would take many decades to react after the level of greenhouse gasses is reduced. Two ºC (Celsius) is equivalent to 3.6 ºF (Fahrenheit); 1.5ºC is equal to 2.7 ºF. The Agreement automatically entered into force on 2016-NOV-04, when 147 countries out of the 197 parties to the convention (75%) had ratified it. At the G7 Summit in Taormina, Sicily during late 2017-MAY, representatives of six of the seven member countries reaffirmed their commitment to the Paris Agreement. They were Canada, France, Germany, Italy, Japan and the United Kingdom. The only exception was the United States; President Trump was present at the Summit, but declined to give his support. The governors of California, Connecticut, Massachusetts, New York, and Rhode Island, Vermont, and Washington anticipated that President Trump might decide to pull the U.S. out of the Paris Agreement. They joined together to continue their work to meet the Agreement's targets independently of any action by the federal government. Together, these seven states represent almost 15% of the country’s emissions. Of the seven governors, two are Republican: Charlie Baker in Massachusetts and Phil Scott in Vermont! CEOs from 30 major companies wrote a letter to President Trump asking that he keep the U.S. in the Paris Agreement. They included 3M, Bank of America, Campbell Soup, Cargill, Chevron, Citigroup, Coca-Cola, Corning, Dow Chemical, E.I. DuPont, Exxon Mobil, General Electric, Goldman Sachs, Johnson & Johnson, JP Morgan Chase, Morgan Stanley, Pacific Gas and Electric, Procter & Gamble, Tesla, Virgin Group, the Walt Disney Company, etc. Senator Inholfe (R-OK) sent a letter to the President recommending that he rescind President Obama's Clean Power Plan. Ending that plan would allow increased greenhouse gas pollution of the atmosphere, and thus increase global warming. It was cosigned by 21 other Senators -- all Republicans. One of the most serious problems with the federal government is the ease by which corporations and very rich individuals can purchase the votes and loyalty of members of Congress. A week after Senator Inholfe's letter was sent, Trump announced that he is starting the process to withdraw the country from the agreement. During his campaign for president, he had called climate change "a hoax" and promised to cancel the country's involvement with the agreement which he said was decimating industries and killing jobs. However, U.S. activity within the agreement is also creating jobs in the solar, wind turbine and other industries, which clearly represent the future of energy sources in the country and throughout the world. "I was elected to represent the citizens of Pittsburgh, not Paris. As of today, the United States will cease all implementation of the non binding Paris accord and the draconian financial and economic burdens the agreement imposes on our country. ... We’re going to have the cleanest air. We’re going to have the cleanest water. We will be environmentally friendly. But we’re not going to put our businesses out of work. We’re not going to lose our jobs. ... We’re getting out, but we will start to negotiate and we will see if we can make a deal that’s fair. If we can, that’s great. And if we can’t, that’s fine. ..."
"The rest of the world applauded when we signed the Paris agreement. They went wild. They were so happy. For the simple reason that it put our country, the United States of America, which we all love, at a very, very big economic disadvantage. ..."
"We don’t want other leaders and other countries laughing at us anymore -- and they won’t be." "... heavily backed by U.S. and global corporations, including oil giants Royal Dutch Shell, ExxonMobil and BP. Large corporations, especially those operating in international markets, have had years to get used to the idea of reductions on carbon emissions, and they have been adapting their businesses accordingly for some time. China is the largest emitter, partly because of its population: 1.4 billion compared to 323 million for the U.S. The Agreement entered into force on 2016-NOV-04. Article 28 implies that the U.S. withdrawal take place no earlier than 2020-NOV-04. By coincidence, this is one day after the next presidential election! Alternately, the U.S. could leave the United Nations Framework Convention on Climate Change (UNFCCC) from which the Paris Agreement was later derived. A country can leave that Convention with only one year advance notice. This would immediately terminate commitments to the Paris Agreement. "Our president is choosing to put American jobs and American consumers first. Our president is choosing to put American energy and American industry first. And by his action today, President Trump is choosing to put the forgotten men and women first." "... a huge job loss for America. ... I don't know what would happen to our manufacturing base." 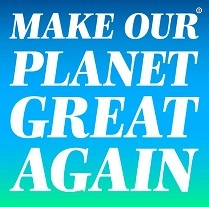 President Macron later promoted an initiative, saying: "I want to make our planet great again. He addressed a message "To all responsible citizens:"
"On the 1st of June, President Donald Trump decided to withdraw the United States from the Paris Agreement, which [had] gathered more than 190 countries united against climate change. We are ONE planet and Together, we can make a difference. "... protect the world we leave to our children. ... I believe the United States of America should be at the front of the pack. But even in the absence of American leadership; even as this administration joins a small handful of [two] nations that reject the future; I’m confident that our states, cities, and businesses will step up and do even more to lead the way, and help protect for future generations the one planet we’ve got." Chrystia Freeland, Canada's Foreign Affairs Minister said that her country can no longer count on the U.S. to play an active role on the world stage. She gave a major speech in Parliament which listed three ways in which Americans appear to want to "shrug off the burden of world leadership." She cited first Trump's decision to pull out of the the Paris Agreement. She also referred to Trump's criticism of NATO members for not paying their fair share and his talk of protectionist trade barriers. "Many of the voters in last year's presidential election cast their ballots animated in part by a desire to shrug off the burdens of world leadership." Paris Agreement, FCCC/CP/2015/L.9/Rev.1" UNFCCC secretariat. This is a PDF file.